I try to keep a well stocked pantry. I never want to be without ingredients like vanilla, spices, chocolate chips, oats, dry fruit, and many other items I deem essential to my happiness. My well stocked, and organized, pantry has made many a recipe on this site possible. Let’s face it, I am a lazy person and if I can avoid an extra trip to the grocery store I will. One consequence of a well stocked pantry is something I call the ‘little bits’. What that means is I have a little bit of this and a little bit of that – not enough for a whole recipe but too much to just toss into my morning oatmeal. So, when this happens I make recipes of the ‘kitchen sink’ variety to use up the little bits. I also make a list for my weekly trip to the grocery store so I can stock back up! This ‘kitchen sink’ cake was a HUGE hit with my co-workers. They loved the moistness of the cake, the blend of warm spices, and the different textures and flavors of the various mix-ins. The chocolate combined with the tart cranberry was a particular favorite of most tasters. You could, of course, use whatever bits of this and that you have, but for some reason the combination below REALLY works! 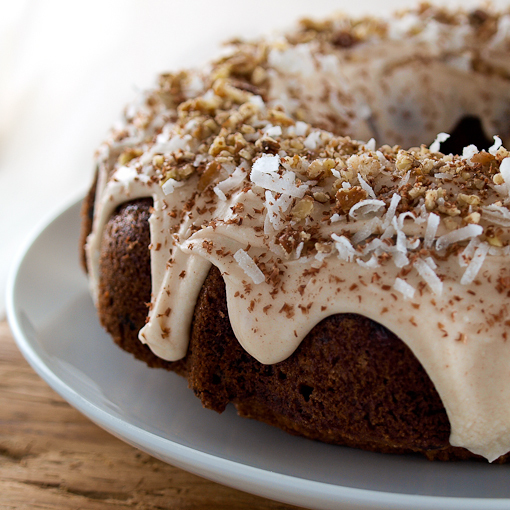 You can bake this cake into muffins or mini-bundts, just reduce the cooking time to 18 to 22 minutes. This would be a brilliant end to a hearty fall meal, a lovely hostess gift for a holiday party, or baked into muffins a lovely grab-and-go treat! 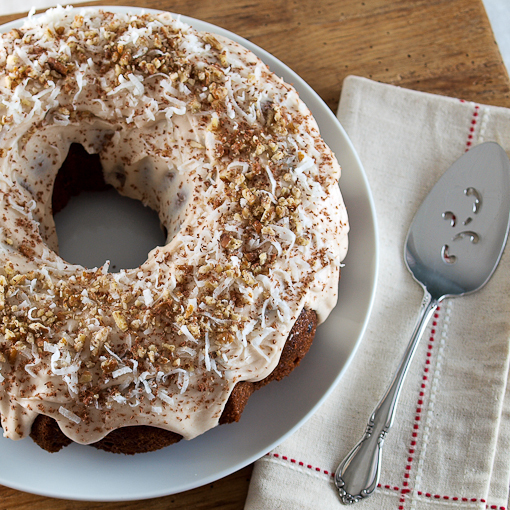 Heat the oven to 350 F and spray a 12-cup bundt pan with non-stick cooking spray. 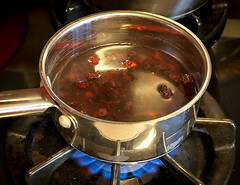 In a medium pot combine the dry cranberries with the water. Bring to a boil over high heat then immediately turn off the heat. Allow to stand until the water has cooled to room temperature, about 45 minutes. Drain the berries and set aside. 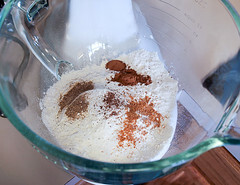 In the bowl of a stand mixer fitted with the paddle attachment, or in a large bowl with a hand mixer, combine the flour, baking soda, baking powder, cinnamon, salt, cardamom, mace, and nutmeg. Mix until thoroughly combined. 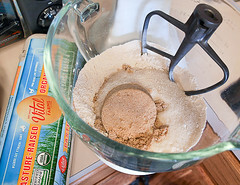 Add the sugar and brown sugar and mix well. 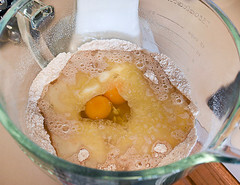 Add the buttermilk, butter, oil, vanilla, and eggs and mix until the dry ingredients are just moistened. 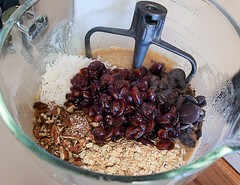 Add the cranberries, coconut, pecans, oats, and chocolate chips and mix until everything is evenly distributed. 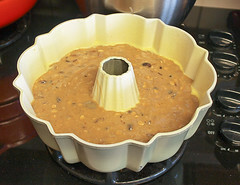 Transfer the batter to the prepared pan and bake for 35 to 45 minutes, or until the cake springs back when gently pressed in the center and it starts to come away from the sides of the pan. 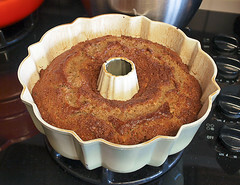 Cool the cake in the pan for 15 minutes, then turn out onto a wire rack to cool to room temperature. Once the cake has cooled prepare the icing. 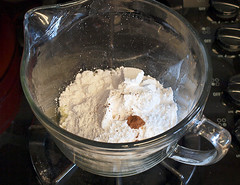 In a medium bowl combine the powdered sugar, butter, milk, water, vanilla, and cinnamon. Mix until the icing is smooth. 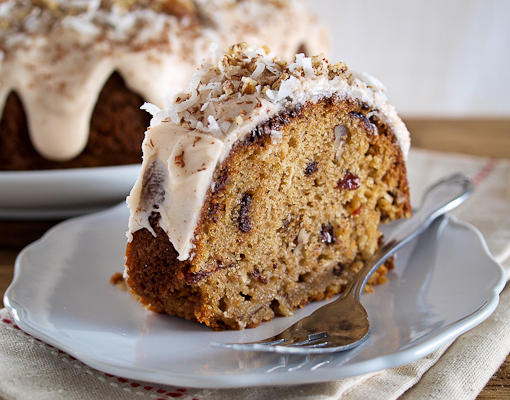 Season with a pinch of salt if you would like to cut the sweetness of the icing. 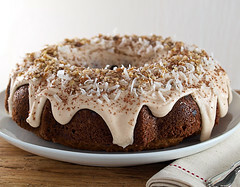 The icing should be the consistency of pancake batter, fairly thick but loose enough to run down the sides of the cake. Spoon the icing over the cake, letting it run down the sides. 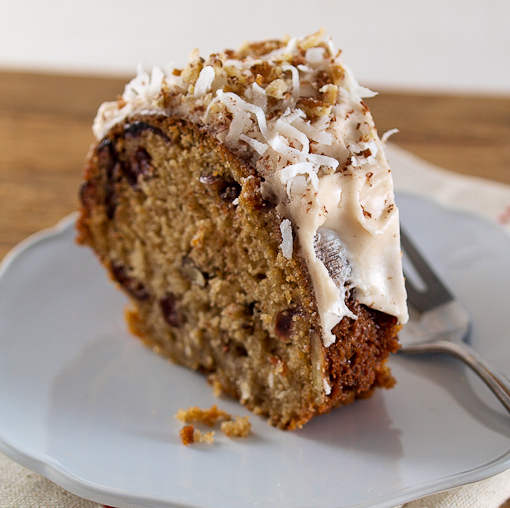 While the icing is still wet garnish the top of the cake with the pecans, coconut, and grated chocolate. Let the cake stand 1 hour so the icing can set before serving.